I haven't joined in with CD Sunday for the last couple of challenges - I've meant to, but somehow not met the (extended) deadlines! This week I'm in nice and early for the 'We are sailing' challenge. I used an image from Joanna Sheen Cardmaker's Year CD which I matted onto blue and then kraft card. 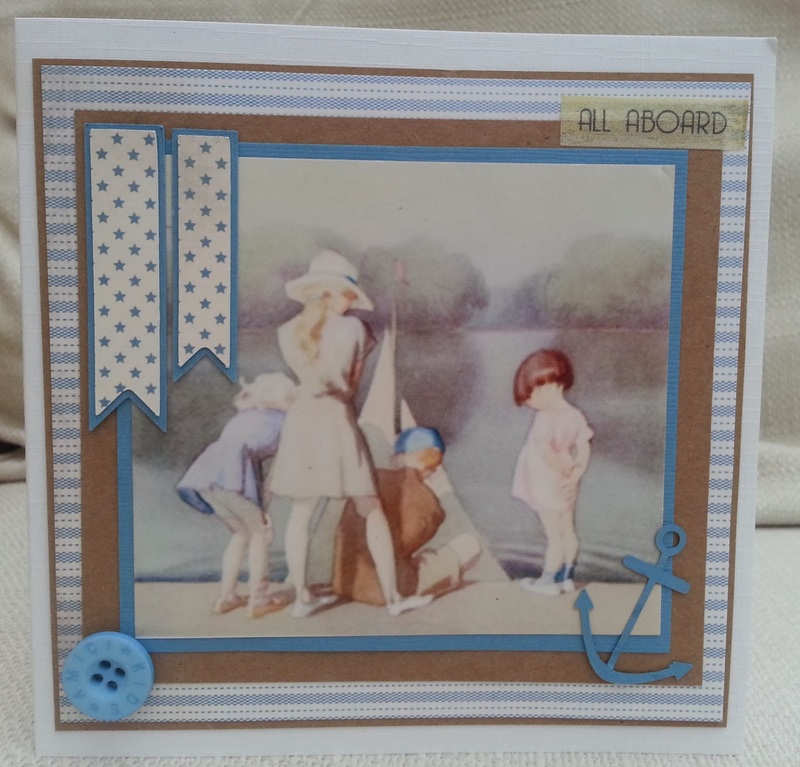 I added patterned paper (Tilda) , die cuts, a button and some washi tape saying 'all aboard'. 1) (picture above). 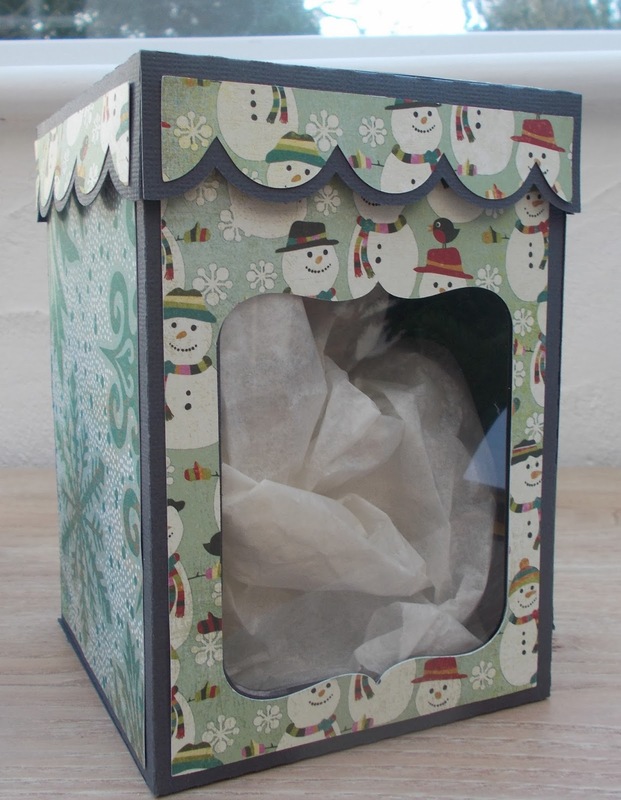 This box was made to put homemade biscuits in as a gift. It's not a cheap packaging option as I used the best part of 3 12x2 cs and 2 Basic Grey patterned papers! 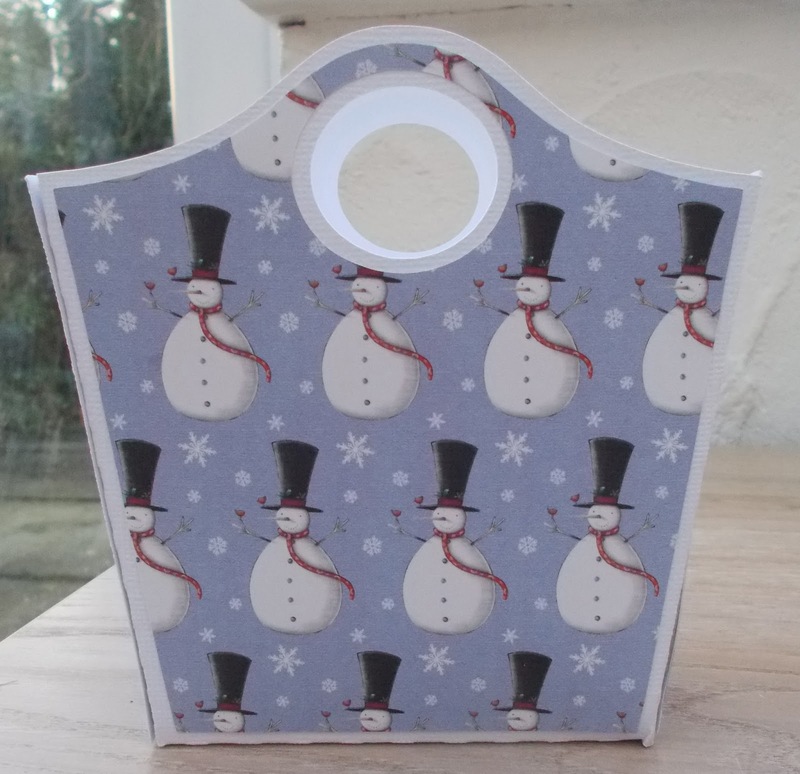 2) I've used the cutting file for this tote bag before but this time I did it Christmas style and put inside a gift for my niece. 3) This little seed packet is one of three I made for the kids. This Christmas, I have overused this reindeer cutting file which I created from a digi stamp and this time I used the negative cut into the seed packet and covered it with acetate. Colour-wise I went rustic rather than Christmas. The packets were filled with oats and glitter that they sprinked outside for Santa's reindeer on Christmas eve. So while I've got all my Christmassy supplies out, I thought I'd scrap some old Christmas photos. These are of my son in 2009 at nearly 3 years old. I used papers from Papermania and Cosmo Cricket. I die cut some Christmas trees and drew lots of wobbly borders. 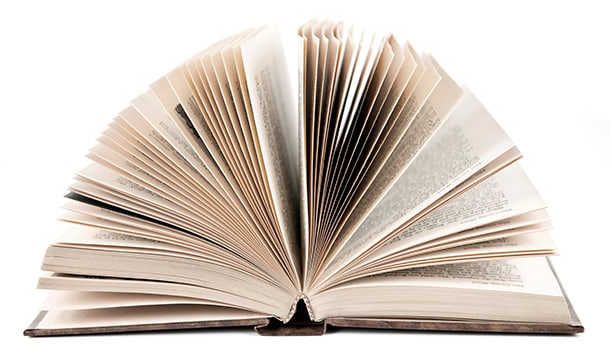 The title I used is also the title of one of the books he's 'reading'. 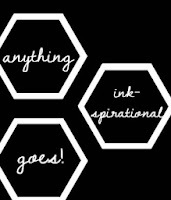 This is my DT project for this week's Inkspirational challenge, and the theme is Anything Inkspirational Goes . Whatever you're working on, why not link it up at Inkpirational ? 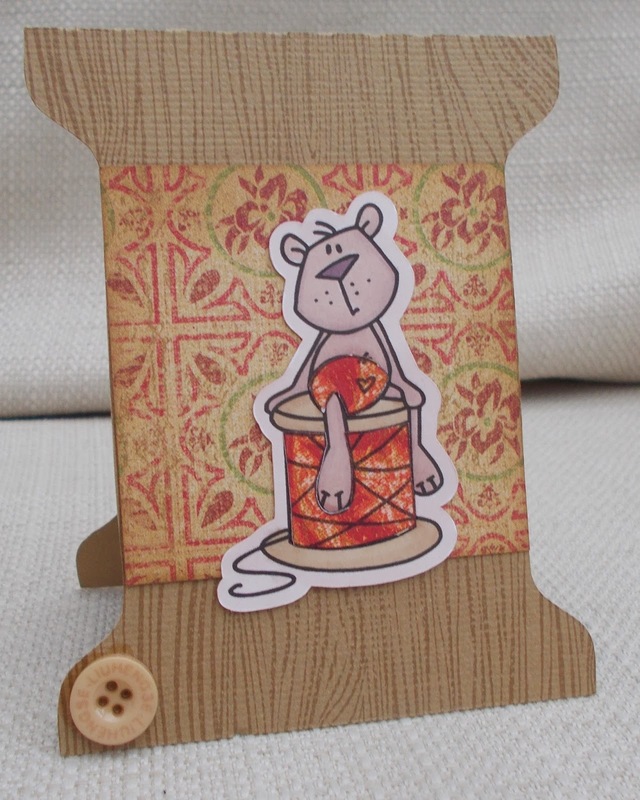 I made a card shaped as a reel, using my Silhouette Cameo. The bear was supplied by our sponsors Bugaboo and I coloured him with Promarkers and paper-pieced. 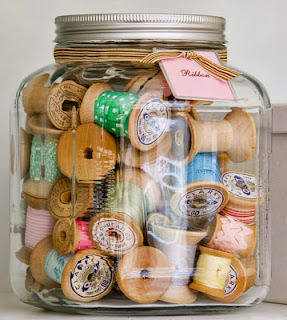 I think I could add a scrap of felt inside and use it as a needle case. 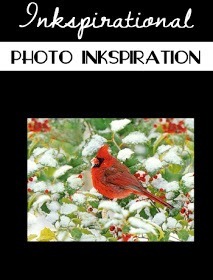 How does this photo inspire you? 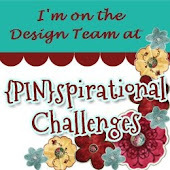 Come over to Pinspirational and join in. 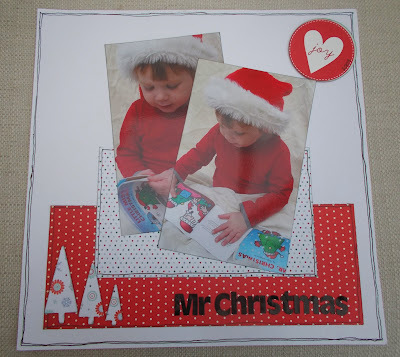 Just as I finished making this card I had a stunning realisation: I've made enough Christmas cards! Any I make now are a bonus. I thought I'd never make it! 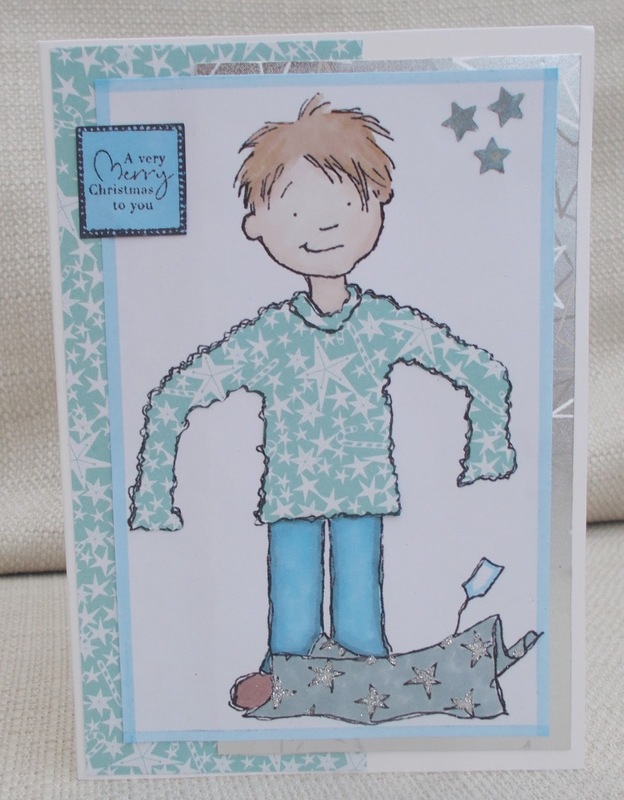 This card uses a Jellypark digistamp that I coloured with Promarkers and paper-pieced. I believe that's a cardinal but we don't have them in the UK and I think many non-crafters wouldn't know what it is. So I went with the British Christmas bird - the robin redbreast. The robin with the cage were cut out from a paper by My Mind's Eye. 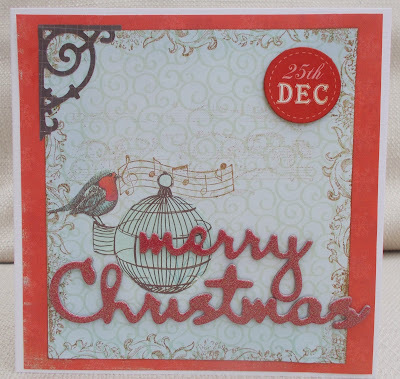 The sentiment is glittered chipboard (also by MME I think, but a different range) . I stamped some musical notes and flourishes around the border of the backing paper (origin unknown) . I also die cut a corner. GDT) have come up with a whole range of different ideas - not just birds. Please join us. The circular die- cut behind my reindeer is called a polar grid - I was thinking ...polar bears/ north pole...but when I looked it up it seemed to be all scary and mathematical! I sprayed the grid with irridiscent glitter spray - it shows up in real life but not on the photo - and nearly knocked myself out with the fumes! 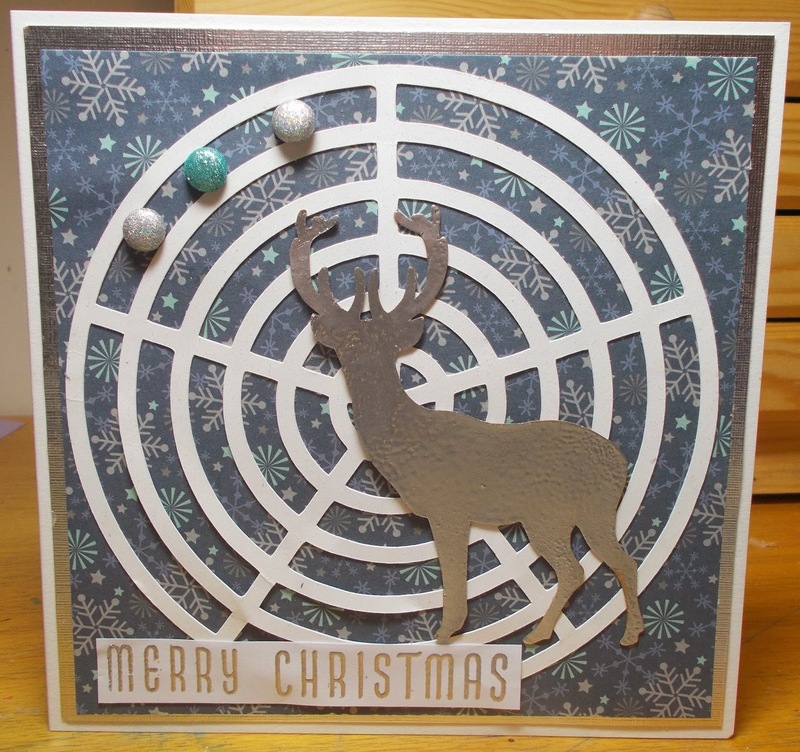 The grid and the reindeer were both cut on my Silhouette Cameo. 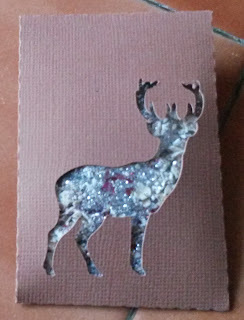 I embossed the reindeer with silver powder and stamped and embossed the sentiment. 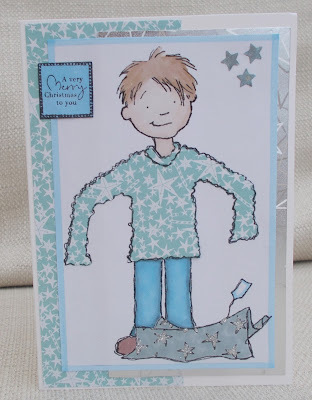 I had a bit of trouble when making this card. I stamped the kraft card with my Hero Arts woodgrain stamp and then put it aside while I made other elements. When I went to stick it all together, I couldn't finds the kraft layer. I spent ages searching for it until I gave up and cut a new piece, and just as I was inking up the stamp I noticed the original piece was right in front of me .....the stamping was so realistic it had 'disappeared' into the wooden table! 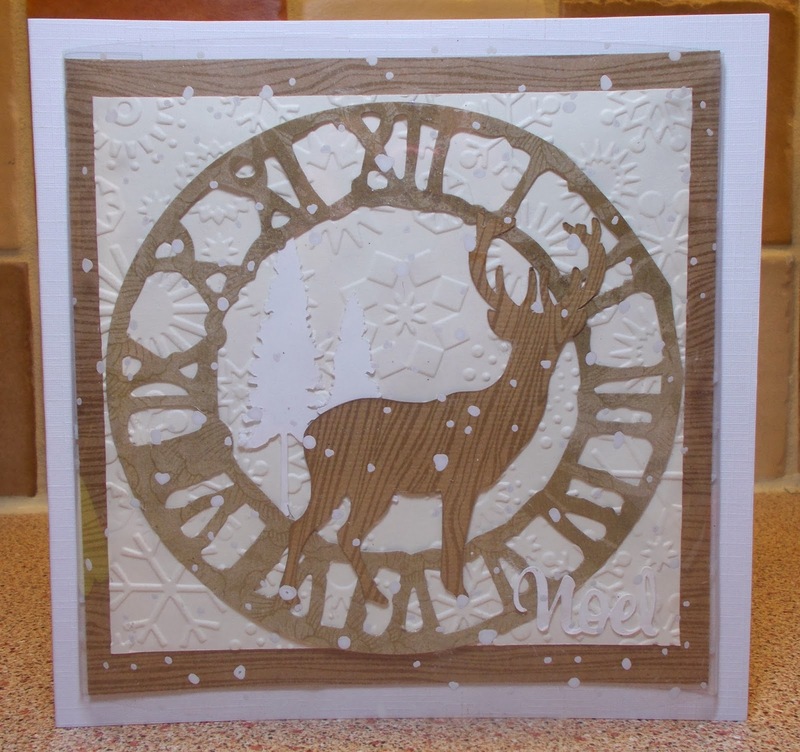 The reindeer was an image from a CD that I brought into Silhouette Studio, traced, cut and stamped with the woodgrain stamp. 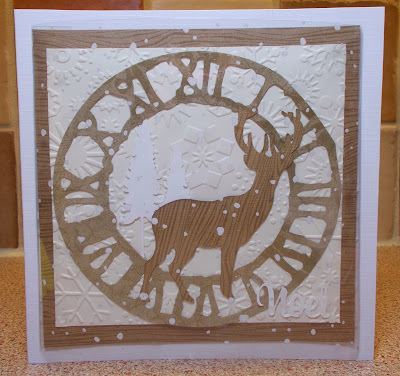 The white trees and 'noel' are also Silhouette cuts and the clock dial is a Tim Holtz die which I spray with gold mist. I used snowfall acetate over the top. 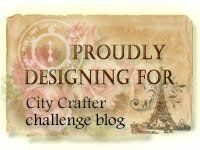 City Crafter Wood and Frame - this challenge was my original inspiration - the clock dial as the frame and the woodgrain stamp for the wood. As I was linking up I realised that I might have slightly misinterpreted and sorry if I got it a bit wrong.